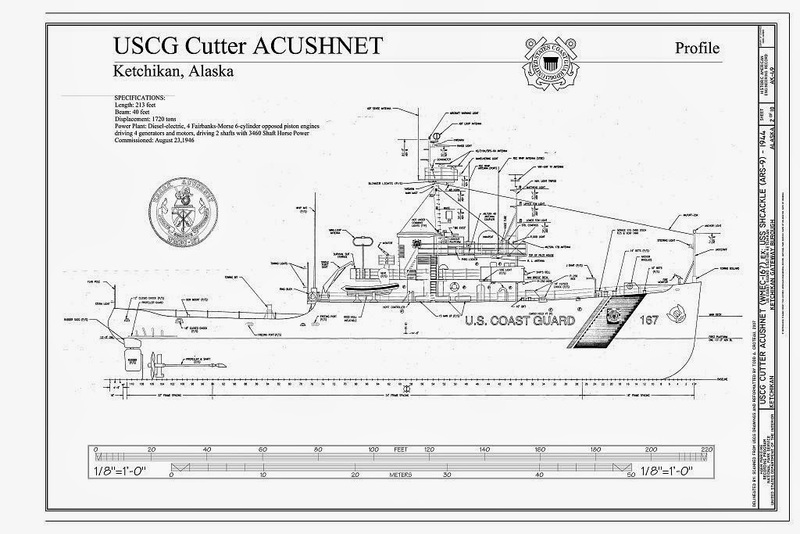 U.S. Coast Guard cutter Acushnet's long career began during World War II as U.S. Navy salvage ship USS Shackle (ARS-9). After joining the Coast Guard, she served as a tug, oceanographic research vessel, and medium-endurance cutter. With the attack on Pearl Harbor, navy shipyards were suddenly hard-pressed to build all the new vessels that would be required for the war effort. The U.S. Navy turned to the U.S. Maritime Commission to contract many of the attack transports, oilers, and other auxiliary ships it needed, such as salvage ships. While the first task of salvage ships was to clear the damaged ships in Pearl Harbor, duties went beyond dealing with destroyed or sunken ships to any repair tasks beyond the scope of a ship's crew, such as fire-fighting or towing disabled craft. The Navy used every resource possible – both military and commercial salvage company - in the design of what would be named the Diver class salvage vessel to which Shackle/Acushnet belongs. Her keel was laid in October 1942 at the Basalt Rock Company shipyard located on the Napa River, and she was launched February 1944. This shipyard constructed all 16 Diver class salvage ships.